‘Tis the season for holiday baking, tasting, and merry-making! What do you give out for the holidays to friends and neighbors? I’m really not one for the traditional savory Chex mix. I just don’t really care for it. Like… at all. But give me some sweetness, coconut, almonds, and graham flavors, and I’m all in. There are roughly 9,286,428 recipes for sweet Chex mix, and (like almost everyone who makes it) I think my family’s recipe is the best. I may or may not be biased. I’ll leave that up to you once you’ve tried and tasted ours. Anyway, it is by no means a health food. It’s a definite treat, but a fun one! My grandma makes this when she has a crowd over to watch college football games, and my mom gives it away for Christmas. It’s perfect for both. A few notes on the recipe: I find it’s plenty sweet already, so I use coarsely grated unsweetened coconut. 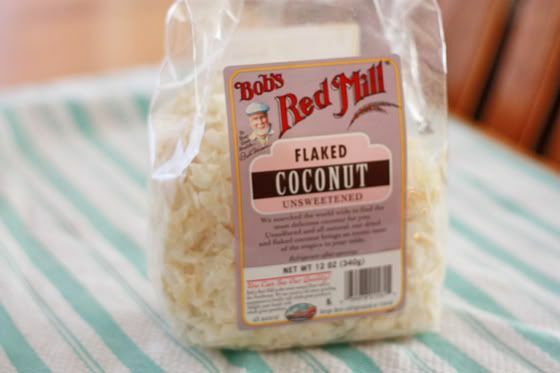 I can usually find it in the bulk section at the grocery store, but Bob’s Red Mill also makes it and sells it. If you can’t find it, or prefer to use the finer, sweetened kind, feel free. Also, there’s no need to buy the brand-name cereals if you’re in a pinch. I’ve used two different store brands and not noticed any difference at all in the end result. I give you fair warning: if you spread it out to dry, prepare yourself for the irresistible urge to nibble at it every time you walk past. Not that I know from experience. 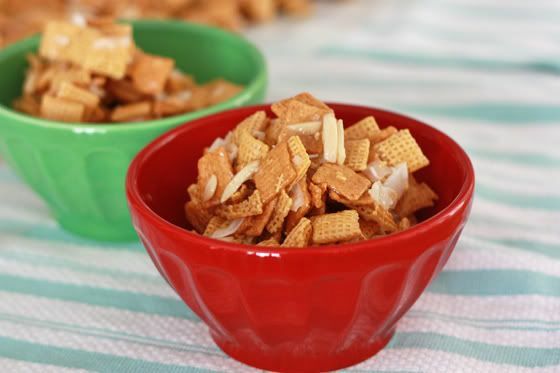 In one or two of your largest bowls, combine cereals, coconut, and almonds. 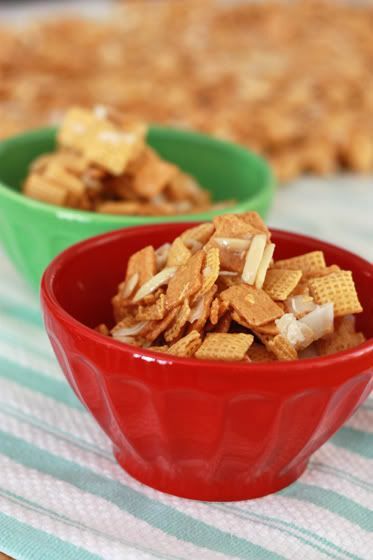 Make sure you’ll have plenty of room to toss the cereal mixture with the warm sugar syrup mixture. In a large saucepan, combine sugar, corn syrup, and butter. Cook and stir over medium heat until the mixture comes to a boil. Boil for 2 minutes, then remove from the heat. Stir in almond extract and pour over cereal mixture. Toss to coat well. If packaging to give away, or if you don’t want it quite so sticky, spread Chex mix out over parchment or waxed paper to dry. Allow to dry up to 8-12 hours before packaging. Oh, that sounds yummy…especially since all I eat anymore are corn chex (it is a pregnancy thing). I may have to make some of this along with my muddy buddy treats! This looks like such a yummy little snack! I, too, have never loved savory chex mix (too salty! ), but I’m all for a sweet variety. 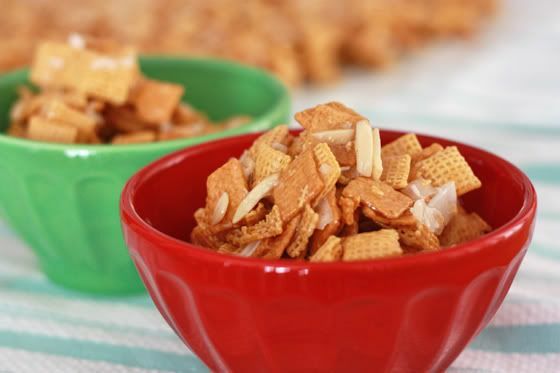 I love the flaked coconut, graham cereal and almonds in this! So yummy and perfect for a little holiday treat to set out for guests. Thanks for sharing, Emily. 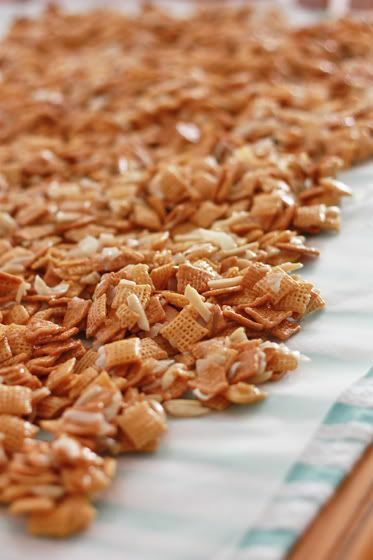 I made white chocolate chex mix a few weeks ago….we ate ridiculous amounts of it in way to short a time frame. So when I also made thin mints recently I had to package it up and give it away…much smarter. I love that you used golden grahams in it!!! SO addicting! 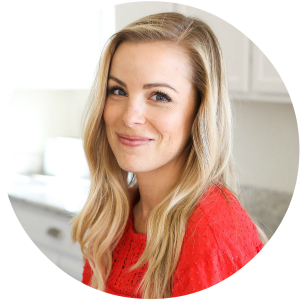 Emily, I never feel remorse for sweet treats I make over the holidays–I figure I can enjoy a chance to be “bad!” 🙂 This looks like a great culinary gift to give away, and I’m always on the hunt for those! This stuff is amazing! I ate so much of it last winter i probably gained 10 lb’s. 🙂 Be carefull not to make to much it will end up on your thy’s lol. But A sugjestion, for a more christmassy look you should put a chocolate syrup on it for decoration (doesn’t really change the taiste just the look) . Any suggestions on what to add instead of coconut? I am not a coconut fan. Tiffany – You can just leave it out, or add some additional almonds or even macadamia nuts, or additional cereal. It’s up to you!